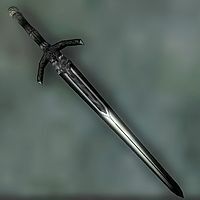 In Morrowind, Umbra was a two-handed claymore, but in Oblivion, it is a one-handed longsword. Umbra is Latin for "shadow" or "ghost". Umbra closely resembles an Ebony Longsword from Morrowind. Umbra has the highest base damage of any one-handed weapon in the game. Umbra is a zero-weight quest item before finishing the related quest. Unlike most other swords, Umbra does not have a sheath. The sword's model is named "FGD05_UmbraSword", implying that at some point in the development it might have been intended to be used during the quest Azani Blackheart.